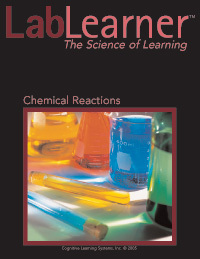 allow students to investigate what occurs in a chemical reaction when one of two reactants is present in a limiting amount. Teacher Preparation for the Investigation includes the following. This preparation should be done prior to students arriving in the lab. Prepare the diluted hydrochloric acid (HCl) solution according to the following table. Note: Spilling the diluted solution should pose no significant risk to students. Any spills should be rinsed with water. Goggles should be worn to prevent splashing into the eyes. If the diluted solution is splashed into the eyes, the eyes should be thoroughly rinsed with water. For each student group, pour 375 ml of the 1N HCl solution into a 400 ml beaker. For each student group, place 3.5 g of Mg metal in a 50 ml beaker. Put all materials at the distribution center. Divide the students into five cooperative groups. Note: Each student lab group will need the materials listed below. Student Preparation for the Investigation includes having students gather the following materials. This preparation takes place on lab day after student lab groups have settled at their assigned lab tables. Note: The materials are listed in students’ SDRs. They are also listed below for your reference. Direct one student from each lab group to collect the materials listed in their SDRs. Inform students that they will perform six Trials during this Investigation. The first five Trials use the same mass of magnesium metal but different volumes of HCl. The last Trial uses a different mass of magnesium metal. 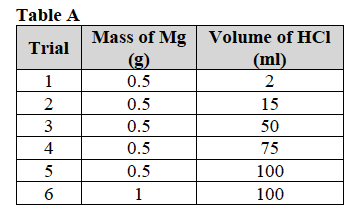 Ask students to use Table A as a guide for the volume of hydrochloric acid and the mass of magnesium needed for each Trial. Encourage students to reflect on the PreLab video as they move through the procedural steps. Explain to students that during the Experiment, every procedural step is important. If one step is skipped, data can become invalid. To help students keep on track, direct them to read each step thoroughly, complete the step, then check it off (Read it – Do it – Check it off). Remind students to wear gloves, safety eyewear, and lab coats when handling chemicals. Direct students to complete the procedural steps in their SDRs. Note: The procedural steps are listed below for your reference. Teacher “Notes” are inserted, as needed, to help facilitate the lab. Note: If students need assistance, refer them to the procedures for Triple Beam Balance Equilibration, Triple Beam Balance Use and Operation, and Measuring Mass Using a Weigh Dish or Beaker. Note: In each Trial, students will collect the hydrogen gas (H2) in a balloon. The magnesium metal needed for each Trial is placed in the balloon which is then secured over the mouth of the Erlenmeyer flask containing the HCl. Once the balloon is secured, the magnesium is emptied into the HCl and the reaction is initiated. The reaction is complete when no more bubbles of gas are produced, approximately 5 minutes for each Trial. Note: The volume of H2 gas produced is estimated by determining the diameter of the inflated balloon after the completion of the reaction. In this Trial you will investigate the reaction of 2 ml of hydrochloric acid (HCl) with 0.5 g of magnesium. Use the centrifuge tube to measure 2 ml of HCl and add it to the Erlenmeyer flask. Use the triple beam balance, lab scoop, and weigh dish to measure 0.5 g of magnesium. Blow up each balloon to stretch and then deflate it. Use the lab scoop to add the 0.5 g of magnesium to a balloon. Stretch the open end of the balloon over the mouth of the Erlenmeyer flask until it securely covers the mouth of the flask. During this step, do not allow any magnesium metal to fall into the flask. Use the triple beam balance to determine the total mass of the flask, hydrochloric acid (HCl), balloon, and magnesium. Record: Write the mass for “Before Reaction” in Table B. Making sure that the balloon does not come off the mouth of the flask, hold the balloon and shake the magnesium out of the balloon until all of it has fallen to the bottom of the flask into the hydrochloric acid (HCl). Gently swirl the flask, so the magnesium stays in contact with the hydrochloric acid. After approximately 5 minutes, the production of the product, hydrogen gas (H2), will have stopped. Do not remove the balloon. Using the triple beam balance, determine the total mass of the flask, hydrochloric acid (HCl), balloon, and any remaining magnesium metal. Record: Write the mass for “After Reaction” in Table B. In this Trial you will investigate the reaction of 15 ml of hydrochloric acid (HCl) with 0.5 g of magnesium. Using the 100 ml graduated cylinder, measure 15 ml of hydrochloric acid (HCl) and add it to the Erlenmeyer flask. Use the triple beam balance, lab scoop, and weigh dish to measure 0.5 g of magnesium. Add the 0.5 g of magnesium to a new balloon. Stretch the open end of the balloon over the mouth of the Erlenmeyer flask until it securely covers the mouth of the flask. During this step, do not allow any magnesium to fall into the flask. Making sure that the balloon does not come off the mouth of the flask, hold the balloon and shake the magnesium out of the balloon until all of it has fallen to the bottom of the flask into the hydrochloric acid. Gently swirl the flask so the magnesium stays in contact with the hydrochloric acid. After approximately 5 minutes, the production of the hydrogen gas will have stopped. Do not remove the balloon. To find out how much hydrogen was produced, use the metric ruler to measure the diameter of the balloon in centimeters. Record: Enter the diameter of the balloon in Table C in the row for Trial 2. Repeat the procedure used for Trial 2 using 50 ml of hydrochloric acid and 0.5 g of magnesium. Record: Enter the diameter of the balloon for Trail 3 in Table C.
Repeat the procedure used for Trial 2 using 75 ml of hydrochloric acid and 0.5 g of magnesium. Record: Enter the diameter of the balloon for Trial 4 in Table C.
Repeat the procedure used for Trial 2 using 100 ml of hydrochloric acid and 0.5 g of magnesium. Record: Enter the diameter of the balloon for Trial 5 in Table C.
Repeat the procedure used for Trial 2 using 100 ml of hydrochloric acid and 1 g of magnesium. Record: Enter the diameter of the balloon for Trial 6 in Table C.
Let students know your expectations for cleanup. Ask them to cleanup.